If there’s anyone who can help students in Carnegie Mellon University’s Dietrich College of Humanities and Social Sciences navigate the internship process, it’s those who have walked in their shoes. Alumni from various backgrounds are returning to Pittsburgh on Thursday, Oct. 25, for Under Construction: Internships, an opportunity for sophomores to meet and network with alumni and learn about the value of internships. Through group conversations over dinner and individual breakout sessions, alumni will help students prepare for internship interviews and discuss how to make a strong impression once they have been hired. Students will leave the event with firsthand knowledge from accomplished alumni that will help guide them during their academic career and beyond. Among the many alumni confirmed to attend are Fran Matten (DC ‘81), a psychology graduate who has worked at Goldman Sachs for more than 20 years; and Lydia Remington (DC ’10), a social and decision sciences graduate and senior clinical informatics analyst at Johns Hopkins Medicine. In addition to talking with alumni, those attending will learn about internship resources available to them, like the Pittsburgh Summer Internship Program and various grant opportunities. Students will also get to hear from Dietrich College upperclassmen about their internship experiences. Transportation to the Wyndham Pittsburgh University Center will be provided. Current Dietrich College sophomores can RSVP for Under Construction: Internships. 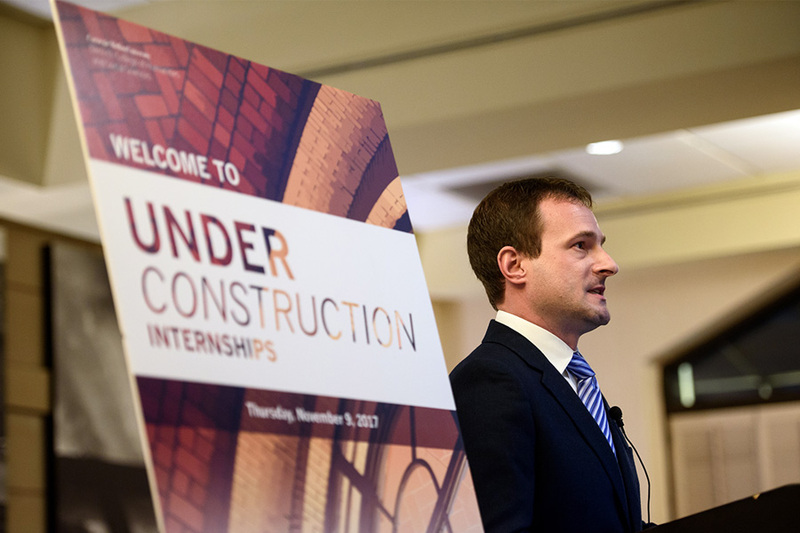 Pictured: Matthew Hannigan (HNZ ‘02), co-founder of The Sprout Fund gave the keynote at Under Construction: Internships in 2017.